What will this year look like? First, the economic landscape in 2019 will certainly be “wobbly,” as detailed in The Economist. Protectionism, populism and anti-immigration continue to be top issues across many countries, along with increasingly turbulent financial markets and high levels of debt. China’s growth rate is predicted to slow down while the economies of a range of countries including Argentina, Venezuela, Iran, DRC, Afghanistan, and Italy are seen as fragile. Even the USA could see a recession towards the end of the year. A global economic slowdown is a strong possibility. Second, in 2019, it will be worth keeping an eye on a range of economic and political issues including Brexit, uncertainty in both Russia (domestically) and China (economically), continuing global trade tensions, preparation for the USA presidential elections, and the European Parliamentary elections in May. Last year, we saw worrying signs of declining freedoms. Will election success in India -- the world’s biggest democracy -- Indonesia and Nigeria in 2019 reverse this trend? And will the ‘strongmen’ continue to be challenged? Meanwhile, other elections to watch in 2019, according to the Council of Foreign Relations, include DRC, Ukraine, Afghanistan, South Africa, Argentina, Canada and Israel. Third, tech will play an ever-increasing role. According to the International Telecommunications Union, half of the world’s population will be online in 2019 but we should not forget that this figure still excludes many poor and vulnerable people. ‘Charity tech’ will emerge strongly with the potential to transform philanthropy and giving. While technology can drive growth, it must do so with equity and empathy in mind. CARE’s mobile cash transfers are one way of using technology at the community level. Take Zimbabwe, for example, where one of our largest ever cash-based emergency responses, supported by the UK Department for International Development (DFID) and other partners, helped nearly 75,000 households facing post-drought food shortages. Instead of using physical cash, the money was transferred electronically via mobile-based money networks and the private companies we partnered with subsidised SIM cards. Businesses and families alike became more proficient with technology over the course of the project. Cash transfers were used by people to feed their families – about 88 per cent of the funds were used to purchase food, and the number of families having to eat less because of the food crisis dropped by 69 per cent. Staying with tech, ‘drones’ when used for good have the power to give a clear picture of disaster zones and they have long been recognised as a complementary tool especially in situations where infrastructure is lacking. CARE has used drones to help map disaster areas and speed up aid access and delivery. Fourth, in 2019, we must not lose focus of some of the world’s most protracted and often forgotten humanitarian crises. It is estimated that in 2019, nearly 132 million people will need humanitarian assistance, only slightly down from 135 million in 2018. Funding requirements are estimated to be nearly US$22 billion just to meet the most urgent needs of over 93 million people in crises. And yet, we are seeing the first shoots of peace in some countries, such as Yemen. In fact, the Humanitarian-Development-Peace Nexus , in which CARE is actively engaged, increasingly emphasises the ‘peace’ part of this nexus. Locally-driven approaches and gender-in-emergencies are two other focus areas in which our work at CARE will be transformational in 2019. Fifth, despite ongoing humanitarian challenges, I feel hope that this year will see change for the better, including a trend towards both equity and empathy. This is partly due to a growing recognition of a single issue holding back so many – that of gender-based violence. I was inspired when the Nobel Peace Prize was awarded to both Dr Denis Mukwege, a gynaecological surgeon, and founder and medical director of Panzi Hospital in Bukavu, DRC, and Nadia Murad, an Iraqi Yazidi woman, human rights activist and survivor of abuse, for their efforts to end sexual violence as a weapon of war and armed conflict. A ‘must watch’ is Dr Mukwege’s moving acceptance speech. ‘Taking action is a choice,’ Dr Mukwege stated and added that the choice includes, ‘whether or not we create a positive masculinity, which promotes gender equality, in times of peace and in times of war.’ These are especially important words for us at CARE. And words we will take with us as we gear up for our umbrella campaign #March4Women. 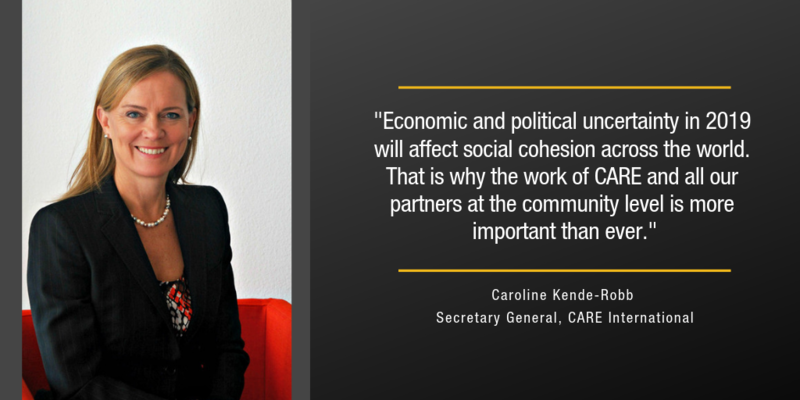 Continuing economic and political uncertainty in 2019 will affect social cohesion across the world and that is why I believe the work of CARE and all our partners at the community level is now even more important than ever. By Caroline Kende-Robb, Secretary General of CARE International, whose 35 years of leadership and management experience have spanned development, politics, and business. Prior to joining CARE, she worked with the late Kofi Annan as the Executive Director at the African Progress Panel. She also worked as a senior manager at the World Bank and IMF and as the Chief Adviser to the Rt Hon Gordon Brown.